The last time we left off in episode eight, we saw Ji-hoo questioning Tae-soo’s love for her as they’re both resting in Tae-soo’s house. With tears in her eyes, she asks Tae-soo, “You did this because you like me right?” Tae-soo tries to prove that his feelings towards her are genuine and sincere, but she still has her doubts, continually asking him what about her he likes or why he likes her. But Tae-soo grows frustrated and irritated, yelling, “Are you a kid? Are you a fool?” To this, Ji-hoo replies that she is a fool. “Because I like you more, I’m okay with being hurt. So even if the people at the office are mistaken that you and Manager Im are dating, I was okay with that. But…at least when I’m with you, I want to know your feelings. After liking you by myself, we’re not going to end like that, are we? 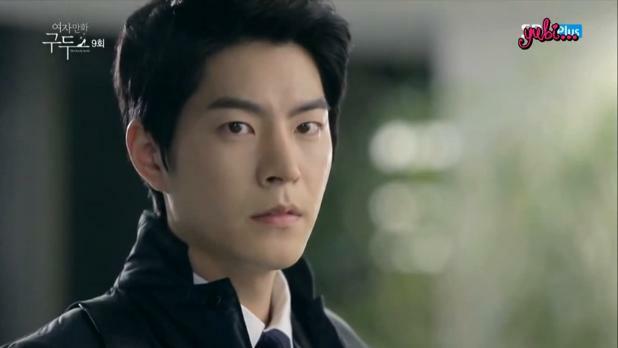 I was scared…” The scene ends with Tae-soo giving a conflicted and confused look. So we see Soo Young (Ji-hoo’s best friend) make her friend some ramen noodles. Ji-hoo reveals to her friend that she just wanted to check Tae-soo’s feelings and whether they were sincere or not. Then we see a confused Tae-soo who thinks back upon Ji-hoo’s words and asks himself what he did wrong. Ji-hoo and Tae-soo are both in their own beds, but is unable to fall asleep as they’re both too busy thinking about the words exchanged earlier that night. The next day at work, Ji-hoo is waiting for the elevator to open. However, when it does, she sees the person she least expected to be there standing in the elevator across from her – Tae-soo. No words are exchanged, just surprised looks that soon turn into glances of pain and anguish. The door closes on them before the neither of them can utter a word. Tae-soo is taking a break with his friend on top of the building’s roof. His friend starts the conversation off with a great question, “Why are women so complicated?” LOL. Tae-soo should exactly understand this question. But as his friend goes off on his own story, Tae-soo can only think about his kiss with Ji-hoo and the incident that occurred the night before. Ji-hoo checks her cell phone at work to see if she got a text from Tae-soo, but when she didn’t get anything from him, she stands up a bit to peek at Tae-soo whose desk isn’t too far from hers. He’s busy working, so she texts him first apologizing and wanting to talk to clarify if they have broken up or not. But then she doesn’t feel too confident about this text so she erases some phrases and yes, of course, she would – happens to leave the phrase ‘let’s break up’ and accidentally texts it. So Tae-soo receives the text saying “Manager Oh, let’s break up” which was NOT what Ji-hoo had wanted to convey. After reading the text, he glances over at Ji-hoo with a deadly glare and walks away, angry. Ji-hoo doesn’t understand and slightly smiles at Tae-soo, but once she receives the deadly glare, her smile disappears and her eyes are fixed upon Ji-hoo’s back. Tae-soo can’t seem to get over Ji-hoo’s text: “let’s break up.” He reads it many times back at home before ignoring it and trying to busy himself with something else. Meanwhile, Ji-hoo’s in her room testing the ‘siri’ app on her phone. Whenever she says ‘I like you’, the app replies to her with statements that she’s not satisfied with – words that she can imagine Tae-soo telling her. She gets angry and decides to do something else on her phone…that’s when she goes to her text messages and notices the text she sent to Tae-soo. Yup, you guessed it right. It was that one. The one that read, “Manager Oh, let’s break up.” Ji-hoo finally understands why Tae-soo looked at her so madly and runs out of house to his. While we see Ji-hoo running to Tae-soo’s house…(you could have gotten a cab ya know? ), Tae-soo’s in his house looking over the photos he took of Ji-hoo in his camera. The doorbell to his house then rings so he goes to open it. When he opens the door, it isn’t Ji-hoo but Manager Im who still hasn’t gotten over Tae-soo. She pushes her way into his house by limping inside and holding onto Tae-soo. She brings herself onto Tae-soo (woah woah woah woah, calm down there) and voices, “I am having a hard time lately.” She leans into Tae-soo for a kiss and successfully smacks her lips onto his.